Don’t bite on this, but next week’s National Dog Bite Prevention Week is a reminder that Fido can cost dog owners—and their insurers—dearly. Dog bite (and dog-related injuries) accounted for more than one-third of all homeowners insurance liability claim dollars paid out in 2015, costing in excess of $570 million, according to the Insurance Information Institute (I.I.I.) and insurer State Farm. In its analysis, the I.I.I. 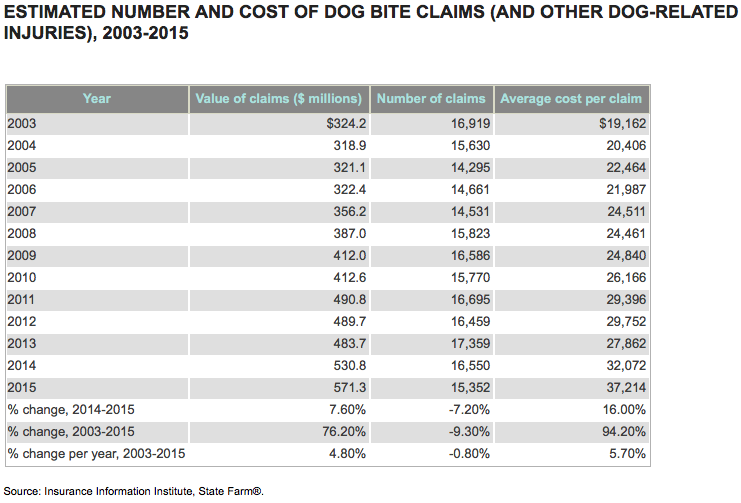 found that while the number of dog bite claims nationwide decreased 7.2 percent in 2015, the average cost per claim for the year was up 16 percent. The average cost paid out for dog bite claims nationwide was $37,214 in 2015, compared with $32,072 in 2014 and $27,862 in 2013. In fact, the average cost per claim nationally has risen more than 94 percent since 2003. Loretta Worters, vice president at the I.I.I., says increased medical costs as well as the size of settlements, judgments and jury awards given to plaintiffs, which are still on the upswing, are responsible for the higher costs per claim. Dog-related injuries also have an impact on the potential severity of losses. In addition to bites, dogs knock down children, cyclists, the elderly, all of which can result in fractures and other blunt force trauma injuries. Another factor might be the surge in U.S. Post Office worker attacks, many of which take place at the customer’s door. The study found the average cost per claim varies substantially across the country. While Arizona had only the ninth largest number of claims at 393, it registered the highest average cost per claim of the 10 states with the most claims: a staggering $56,654.